Looking to do a new review and wanting to heed our fans requests for local places, we decided to check out STONE BRIDGE RESTAURANT in nearby Tiverton . We've never been here even though they've been in the business almost 30 years . It's very unassuming from the outside and indeed this day they were doing some renovations but friends have told us it was a very upscale establishment . We arrived around 2:50 on a sunny Saturday afternoon . There were a few people inside but it was mostly quiet . The interior was lovely .It was small, immaculate and was dotted with wooden tables decorated with fresh flowers . 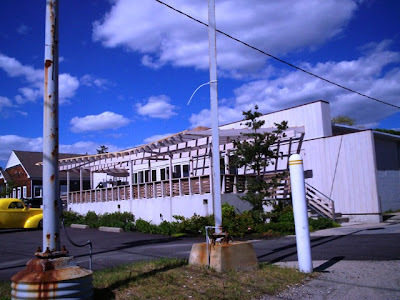 The large windows overlooked Sakonnet River which made for a scenic view . 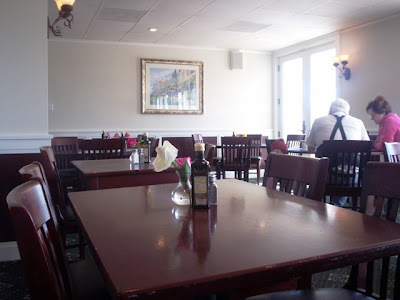 Although the tables were " bare" (devoid of tablecloths and silverware) when we dined , around 4:00 they were being covered by crisp white tablecloths . I guess they're a bit more formal toward evening . Anyway , they looked lovely. After a bit of a wait ( there seemed to be only one waitress ) ,Tracy came over and pleasantly took our drink order ...2 diet sodas . We looked over their eclectic menu and then I panicked . Laura said there was nothing on it that she wanted . OMG . She'd looked through quickly and the things that stood out to her were all things that she was unfamiliar with like - duck , lamb , escargot - you know , " fancy stuff " . It panicked me because Laura is the more adventuresome eater of the two of us . But staying calm , I looked carefully at their wonderful menu and could find many things we were familiar with and could enjoy . Now I know what you're thinking .....HOW CAN YOU REVIEW RESTAURANTS WITH SUCH LIMITED PALATES ? That's a great question and I'll address it in the P.S. following this review . Now to continue . After returning with our sodas , Tracy took our order . We each decided to go with an appetizer and a sandwich. 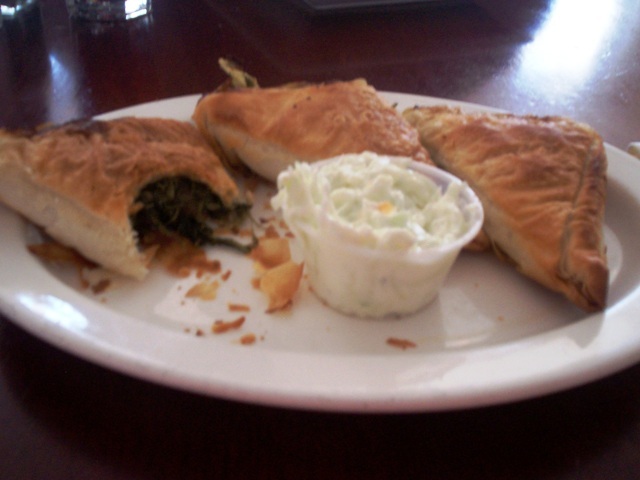 I chose the Maryland crabcakes ( 10.95 ) and Laura chose the Spanikopita ( spinach pies -7.95 ) . They both came 3 on a plate with garnishes and dipping sauces . 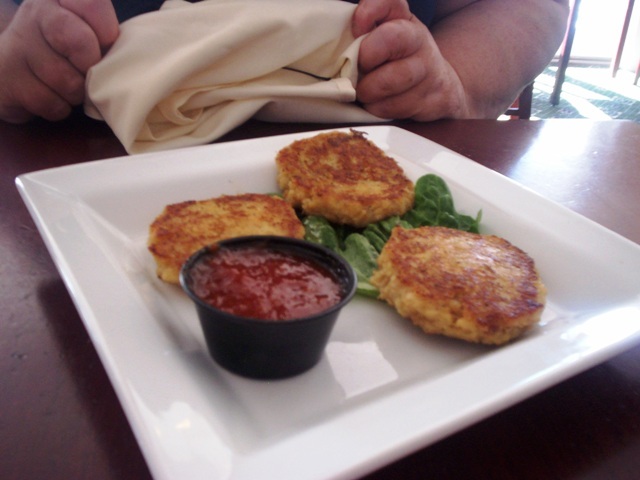 My crabcakes were fantastic , crisp outside , moist and meaty inside and spiced perfectly . I loved them and ate every bit . Laura's pies were absolutely filled with fresh spinach and the outside was so flaky. She declared them delicious . We couldn't wait for our sammies . 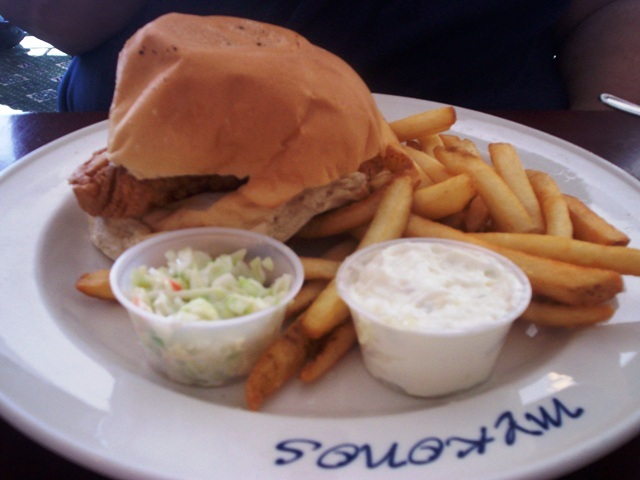 I ordered a cod sandwich ( 7.95 ) and Laura ordered a tuna melt on croissant (6.95 ) . It took awhile for them to arrive but when they did we were both impressed . My sandwich was on a large fresh roll and the cod fillet was thick and perfectly done . The accompanying fries were hot and tasty . Laura's tuna melt was fantastic . 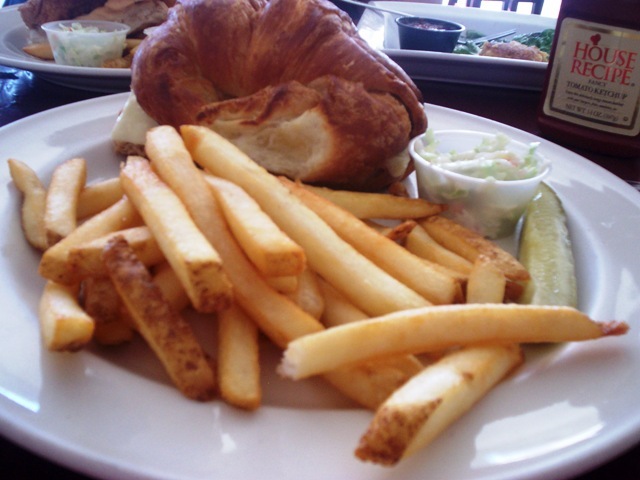 Large flaky croissant filled with wonderfully spiced tuna salad and cheese and a mound of those great fries and a pickle . These were great sandwiches , in fact , they couldn't have been better . We were very impressed by the quality of everything we had . And after carefully examining the menu I found some other selections I'd like to try because if our sandwiches were this good , I can only imagine how well they make everything else on the menu .We'll be back . VERDICT : You have to try this restaurant . Hopefully you'll be more adventurous than we were and try some of their more exotic choices like : fried smelt , shrimp & scallop Ceasar salad , grilled lamb kabobs , Greek sausage plate , chicken with fig sauce , sauteed duck breast and a great selection of fresh seafood , homemade pastas , prime steaks & chops , delicious duck and Italian & Greek favorites . Prices are reasonable for the quality of the food , the most expensive items being 24.95 . They also have a full bar . Check out their web-site for a full menu . With a 20% tip for Tracy ( who was a great waitress ) we left $49.00. Of course we checked out the ladies while we were there . First of all it's quite the maze to get to it . Then there was NO light switch . I saw a switch WAY over the door but I didn't know if it was a light or an alarm plus I couldn't reach it . I had visions of me switching it on though only to have lights flashing and sirens going off . LOL So I used the ladies sans light . Maybe they only turn it on at night . Weird . Also , although clean . the restroom was a little disheveled . The paper holder was all askew on the wall and there were papers on the floor . Laura thought the same . P.S. Now let me explain about our dining habits . Although , as mentioned , Laura is the more adventuresome eater , we both have very simple dining tastes . Never having been exposed to the " finer " aspects of gourmet fare , we tend to stick to what we know and like ( which tend to be simple foods , simply prepared ) . That , unfortunately, limits us more than I care to admit . I'd really like to expand my palate but I don't want to be stuck with a large portion of an expensive dish that I just found out I don't like . I'd be willing to take a taste of duck or lamb or eel , but a taste FIRST , not a plate full . I wish we went out with someone with exquisite and exotic tastes , so we could grab a bite off his plate to try some . I refuse to order a 30.00 dish and take a bite and throw it away . I can't stand waste like that . I know it's become a trend with some people to order a bunch of different foods , take a bite of each , and they discard them ( so they don't over-eat ) . I think that's a sin . So I'll wait until I can have a taste of someone's unfamiliar ( to me ) meal before I order a plate for myself . Anyone got any duck ? Eel ? Escargot ??????? 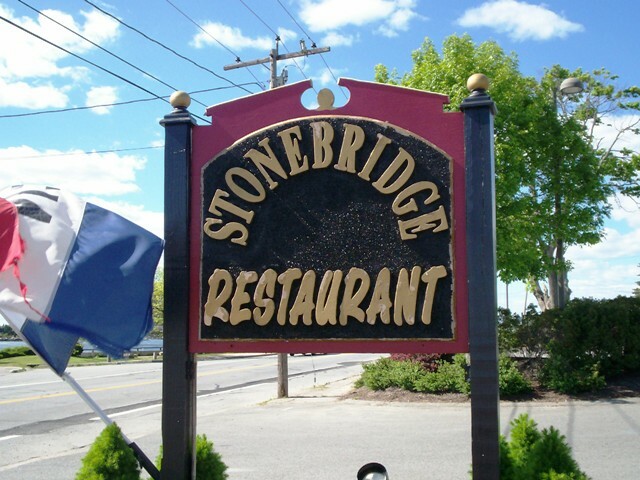 The Stone Bridge Restaurant is open from 4:30-9 p.m. Monday, 11:30 a.m. to 9 p.m. Tuesday through Thursday, 11:30 to 10 p.m. Friday and Saturday, and 11:30 to 9 p.m. Sunday. Don't forget to visit our friends at MENU JOY for some great local restaurant menus.